A weekly newspaper beat off competition from three dailies to be crowned Newspaper of the Year at last night’s Midlands Media Awards. The Tamworth Herald triumphed from a shortlist of six, while the Birmingham Mail was the biggest overall winner, with four gongs. 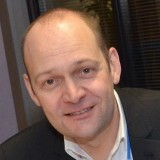 Among them was Jon Griffin, who retained his Business Journalist of the Year title after taking voluntary redundancy from the newspaper in July. The Herald, editor Gary Phelps pictured above left, saw off the Ashbourne News Telegraph, Coventry Telegraph, Derby Telegraph, Express & star, Wolverhampton and the Hinckley Times to win the Newspaper of the Year crown. There was some consolation for the Express & Star, which won News Website of the Year. The judges, headed by Peter Lowe, managing editor at Sky News, said the Herald’s entry was “a clear favourite with terrific front pages, superb pictures and original local journalism”. Scoop of the Year went to Martin Naylor, of the Derby Telegraph, after the judging panel rated his article on “The True Identity of City’s Would-be Suicide Bomber” as a fine piece of investigative journalism that led to him exposing a man already convicted of hate crimes as a terrorist fighter with Islamic State. For the second year in succession, Adam Smith, from the Halesowen News, was named as News Reporter (Weekly). A record 37 entries were received for the News Reporter (Daily) category, which was won by Andy Richards, of the Sunday Mercury. Photographic honours went to Angela Ward, Nottingham Post, Mike Sewell, Leicester Mercury, and Anna Draper, Lincolnshire Echo. Held at Aston Villa FC’s Villa Park ground, the awards were sponsored by Birmingham Airport and organised by Cloud 9 Event Management as part of Birmingham Press Club’s 150th anniversary celebrations. @Luka. I couldn’t believe I read that either. Congratulations to former Birmingham Mail colleagues Ross Hawkes, Jon Griffin, Neil Elkes, Andy Richards and Adam Smith – although it’s a sad sign of the times that only 2 of the above remain with the paper.